The indoor sports hall ... Heradesign panels. Knauf AMF, a leading European manufacturer of high-quality ceilings and wall panels, recently supplied Heradesign wall panels for the Hartland International School project in Dubai. Owned by the Sobha Group, the school comprises primary and secondary sections housed in one large campus located in MBR City, Meydan. The school prides itself on its extensive facilities, particularly in sport. The indoor sports hall at Hartland International School is designed for multi-sports use and is subjected to tough daily use. Sobha Engineering and Contracting, the contractor on the project, specified Heradesign wall panels because they offer outstanding acoustic properties and durability, which are required to create an environment where staff and children can interact together in comfort, according to Sreejith Panicker, director – operations for the Middle East at Knauf AMF. “Heradesign offers the highest sound absorption and impact resistance, making it excellent for busy, demanding areas. In addition, the use of bright colours is taking the sports hall into a new dynamic era. The school liked the mix of different coloured wall panels that add a visual energy to the hall,” he said. The installed surfaces in the hall need to withstand the constant impact of balls in use during sports events. Hence, the lifespan of such surfaces is determined by their impact resistance. “Heradesign, a range of ceiling tiles and wall panels manufactured from sustainably sourced wood-wool, has a superior durable woven surface that offers the highest Class 1A impact resistance. It is a cost-effective solution for heavy-duty areas,” Panicker pointed out. 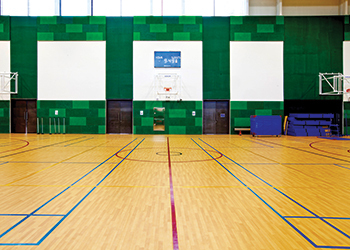 This apart, the architect has tastefully exploited the use of colour for the sports hall by specifying Heradesign in three green shades in a chequerboard pattern to produce a space which is visually stimulating. Heradesign can be matched to any colour using popular colour systems including RAL, NCS and StoColor, he said. In addition, it is available in a wide selection of face patterns, edge details, standard and bespoke sizes, offering architects further design possibilities.